The Geek Culture Forums! : Steve retires as CEO ... ! » The Geek Culture Forums! » News, Reviews, Views! » Your News! » Steve retires as CEO ... ! Author Topic: Steve retires as CEO ... ! Despite this, I still hope he will remain with us for a while longer. He'll still be around as Chairman of Apple. It's like he's kicked himself upstairs. In any event, I believe he'll still be around for some time to come, influencing Apple's product directions. Pancreatic cancer is a tough puppy to beat. He's lasted longer than most. My uncle was gone 4 months after diagnosis. I hope for Apple's sake that he has groomed some visionaries. 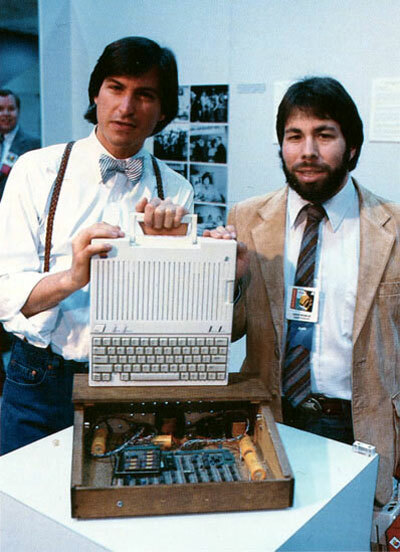 In the NYT article about steve retireing, on the cover, they are running a picture of steve with my first computer. I am just excited because no one remember the IIc. after 20 minutes of trying I have discoverd that the NYT makes it very difficult to post a link to thier pictures. Of course I may be overestimating your age. You didn't say -which- IIc you had. Thanks, the second one. And you would not be overestimating my age, I got my first computer when I was 5 in 1984. Which was technically the family computer, the first one my parents had bought whole and didn't have to build themselves. I didn't know there was more than one version of the apple IIc. I am still upset my parents threw it away when I went off to college. I learned programming on the thing. THough I don't think Apple LOGO is a usefull programming language any more. And Logo isn't entirely useless if you use one of the compiled versions like Lhogo or Liogo. Neither is anywhere near as capable as a modern language, but simple programs don't require that much capability. As for Jobs, I hope he hasn't actually waited until he's no longer capable of fulfilling his job duties despite what his letter says. He deserves a few more years to enjoy life with no obligations, meetings or deadlines. Our first home computer was a Trash 80 complete with tape recorder. LOL If you bought even one share in Radio Shack you got a store discount, which we used on the computer. The first I messed with was a PDP 11. I hope he gets to have some quality family time. The Apple IIc was the first computer I ever used. My elementary school had a computer lab full of them. I think I was in 3rd grade when they expanded the lab by adding a bunch of IIgs's. Sad to hear about Steve. Does anybody remember that when he came back to Apple he was supposed to be the "interim CEO?" skills honed to perfection. I was totally bummed after 6th grade when my father refused to get a TRS-80 of our own so I could keep working on my Electric Pencil files forever. My high school programming classes were done on Bell & Howell machines that were apparently rebadged Apple II+'s. Does anybody remember that when he came back to Apple he was supposed to be the "interim CEO?" Or "iCEO," as he put it at the time. But, in that time, he took a company that was languishing literally on the brink of bankruptcy, and turned it into the most valuable computer and consumer electronics company in the world. Not to mention completely reinventing the cellphone as we know it; reinventing the way people buy, store, carry, and listen to music; breaking the backs of the RIAA mafia and creating the biggest music store in the world; building a retail empire with greater revenue-per-square-foot than Tiffany's; reimagining the laptop computer; and pioneering a whole new class of computing devices that will turn the computing world upside down the way he did twice before. Any one of these accomplishments would qualify him as a titan of industry. If there's someone who's earned his retirement, Steve Jobs is it. But he's not all that retired...the Hand of Steve will still be behind Apple for as long as he draws breath, and beyond.